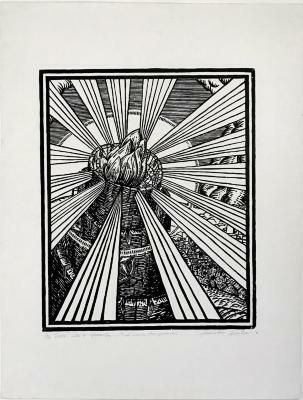 Juan Carlos, Las 7 Maravillas: La Luz de los Mortales, Linocut, 5/12, 16.5 in X 13.25 in, 1994. 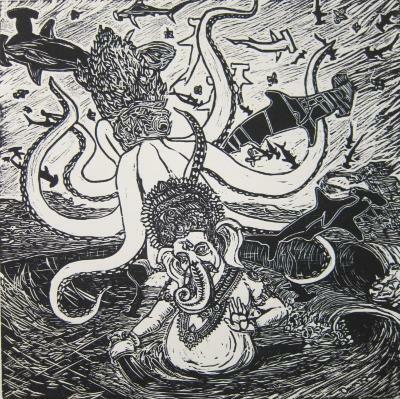 Juan Carlos, Las 7 Maravillas: El Jardin del Caribe, Linocut, 5/12, 16.5 in X 13.25 in, 1994. 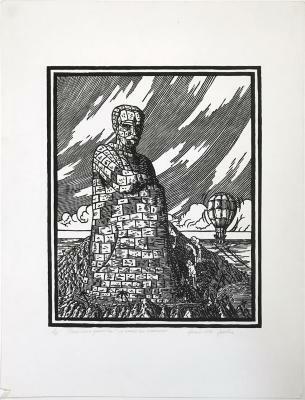 Juan Carlos, Las 7 Maravillas: La Mirada Que Estremese, Linocut, 5/12, 16.5 in X 13.25 in, 1994. 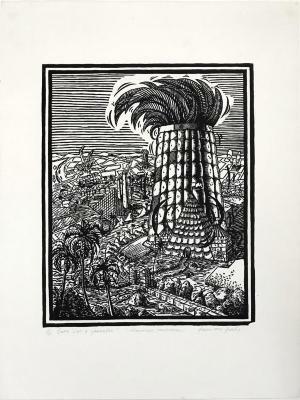 Juan Carlos, Las 7 Maravillas: Piramides Tropicales, Linocut, 5/12, 16.5 in X 13.25 in, 1994. 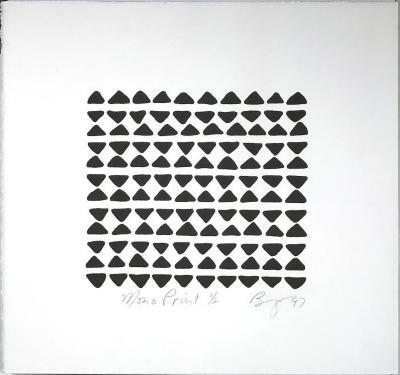 Bill Fick, Untitled, Linoleum Block Print, 39 in X 49 in, 1992. 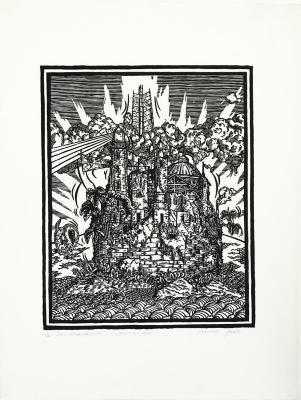 Jay Zieger, Windmill Series II, linocut, AP, 10.25 in X 10.25 in, 1981. 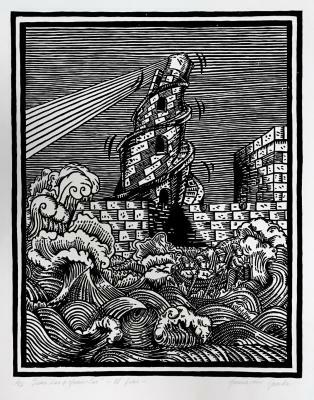 Jay Zieger, Windmill Series IV, linocut, AP, 10.25 in X 10.25 in, 1981. Jay Zieger, Blue, Green and Red Motorcycle with Blue Background, linocut, AP, 10 in X 12 in, 1979. Jay Zieger, Blue, Green and Yellow Motorcycle with Red Background, linocut, AP, 10 in X 12 in, 1980. 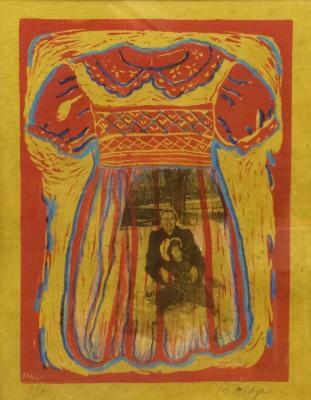 Jay Zieger, Blue Bicycle on Red Background, linocut, AP, 10 in X 12 in, 1981. 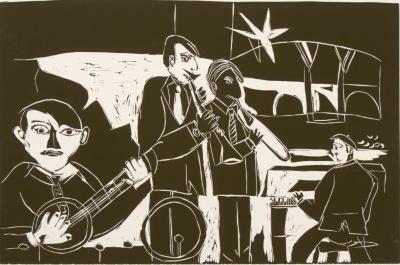 Leslie Kerby, Beach Conversation, Linocut, 22 in X 30 in, 2004. Leslie Kerby, Dairy Man’s Diner, Linocut, 30 in X 22 in, 2003. 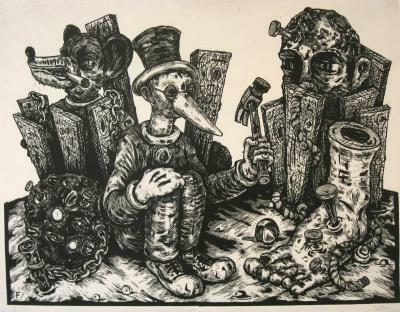 Leslie Kerby, The Player’s Club, Linocut, 22 in X 30 in, 2001. 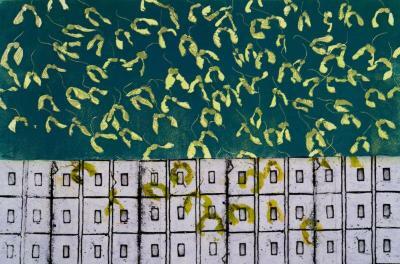 Kate McGloughlin, Seaweed at Pebble Beach, Linocut, ed. 3/20, 4 in X 6 in, 2002. 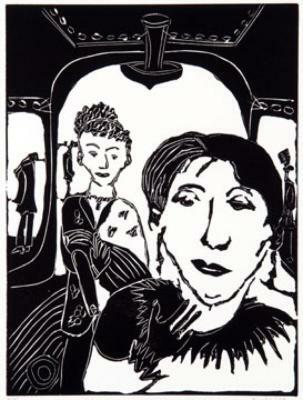 Kate McGloughlin, First Snow, Linocut, 4 in X 6 in, 1997. Kate McGloughlin, Hudson River Parkway, Linocut, ed. 5/10, 8 in X 6 in, 1998. Kate McGloughlin, Toscana, Linocut, ed. 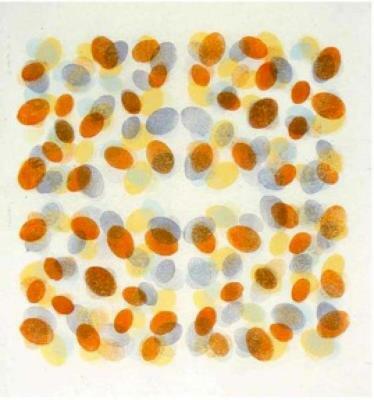 3/10, 8 in X 6 in, 1998. 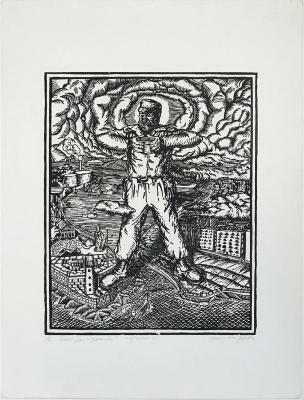 Kate McGloughlin, Sotto Il Ponte, Linocut, ed. 9/20, 6 in X 4 in, 1999. 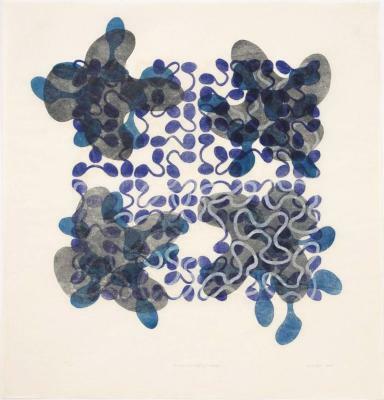 Kate McGloughlin, Branches and Vines, Linocut, ed. 3/20, 8 in X 6 in, 1996. 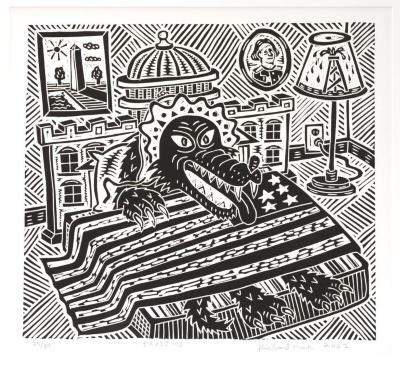 Richard Mock, Bush Knew, Linocut, 5/80, 18 in X 20 in, 2002.